Mr Aleister Crowley, editor of The Equinox, having published the facts concerning the “Rosicrucians” in various numbers of that magazine, has been attacked by the gang whom he exposed in such a way that he has had no opportunity to make clear the facts in a more public manner. Mr Crowley is debarred from taking legal action by the reasons set forth hereafter. I have therefore determined to publish in a striking form the truth of the matter, less to defend him (he has no need of it) than to bring to an end the villanies of the “Rosicrucian” gang. I have proceeded on the principle that Mathers is obliged either to tell the truth or to repeat his previous statements. The latter are indicated by inverted commas. It is against the express wish of Mr Crowley that I have, in his own phrase, “played scavenger;” but I rather break my Vow of Holy Obedience than allow his work to be hindered, as I cannot but maintain that it has been hindered hitherto. 5 King’s Bench Walk, Temple, W.C. Details of Cran’s perjury in the Court of King’s Bench in April 1911 are here omitted for reasons which may become clear hereafter. since professional blackmailer to the nobility and gentry. Coroner, sorcerer, etc. Dupe and victim of Mathers. Ex-dupe and victim of Mathers. The Cross-Examination of Samuel Sidney Sylvester Scherzerade Socrates Scipio Schiller Simmons Scrutton Shacaback Swank Swizzle Liddell Diddell Macgregor Mac Kerrow Mathers, James IV of Scotland, Comte de St Germain, Earl of Glenstrae, Comte Macgregor, Chevalier Mac-gregor, Macgregor-Mathers, S’Rhiogail mo Dhream, Deo Duce Comite Ferro, Chevalier of the Order of St Germain, etc., etc., by Mr Q. Scorpio, one of His Majesty’s Counsel learned in the Law. Scorpio, K.C. What is your name? Scorpio, K.C. The name on your birth certificate. Scorpio, K.C. You were educated at Bedford Grammar School? Scorpio, K.C. And became a lieutenant in a Hampshire volunteer regiment? Scorpio, K.C. Yet in Paris you were engaged in Jacobite conspiracies to overthrow the throne of England? Mathers I pretended to be. Scorpio, K.C. Were you actually so engaged? Mathers I refuse to answer the question. Scorpio, K.C. You became a Rosicrucian? Scorpio, K.C. You hold high rank in the Order? Scorpio, K.C. You have read the constitutions of that Order? Scorpio, K.C. It is a secret Order? Scorpio, K.C. By the constitution no member is permitted to declare himself to be a member? Mathers That is what Waite says. Scorpio, K.C. Who is Waite? Mathers The greatest living authority on the Rosicrucians. the case in which the essence of a lie consists.” What have you to say to that? Scorpio, K.C. Who are they? Scorpio, K.C. In the constitutions of the Golden Dawn a Fraulein Sprengel or Sapiens Dominabitur Astris is named as one of them? Scorpio, K.C. Is it so or not? Scorpio, K.C. In your letter to Mrs Emery of the 16th February 1900, you say: “It may interest you to know that Soror Sapiens Dominabitur Astris is now in Paris working with me”? Scorpio, K.C. Was this Fraulein Sprengel? Scorpio, K.C. Who was it? Scorpio, K.C. The same Madame Horos who in 1901 received a sentence of seven years penal servitude for abominable offenses against children? Mathers How was I to know that she would be found out? Scorpio, K.C. You acknowledged her as your spiritual superior? Scorpio, K.C. As a secret chief 8= 3? Scorpio, K.C. Thank you. Now with regard to Allan Bennett. He was staying with you in Paris? Mathers In trying to make rubies from ruby dust. Scorpio, K.C. Did he succeed? Mathers He made a small worthless ruby. Scorpio, K.C. With better apparatus he might have made a commercial success of the process? Scorpio, K.C. In point of fact, a precisely similar process is being worked at this day with success? Scorpio, K.C. What was his moral character in regard to sexual matters? Mathers He had an aversion to all such matters amounting to horror. Scorpio, K.C. What was the condition of his health? Mathers He was a constant sufferer from spasmodic asthma in its most aggravated form. Scorpio, K.C. He took drugs habitually? Mathers Yes, by the orders of his doctor. Scorpio, K.C. Never for pleasure? Scorpio, K.C. How can you be sure? Mathers When he left England, the change of climate cured at least temporarily his disease, and he instantly abandoned the practice. Scorpio, K.C. He left you on good terms? Scorpio, K.C. And you have never quarreled with him since? Scorpio, K.C. Then why do you defame him now and allow the vilest crimes to be imputed to him? Mathers Anything to damage Crowley! Scorpio, K.C. Did you quarrel with him ever at the time? He (Crowley) had, as we have seen, induced Mathers to put in force the Deadly and Hostile Current of Will, but, as in the case of the Jackdaw of Rheims, nobody seemed a penny the worse. One might have expected that Mathers having failed, Aleister Crowley would have abandoned him. No, for it seemed still possible that Mathers, really in touch with the Supreme Chiefs, had yet finally decided to say with Christ upon the Cross: “Father, forgive them, for they know not what they do,” even though this theory was somewhat rudely shaken by Mathers spending the whole of one Sunday afternoon in rattling a lot of dried peas in a sieve under the impression that they were revolted members: as subsequent events proved, they were only the ideas in his head. So we find Aleister Crowley still loyal, if a little skeptical, and searching within himself to discover a touchstone by which he might prove beyond doubt the authenticity of Mathers’ claim to represent the Masters. Now, there had been a good deal of talk of an adventure that happened to Mathers and Allan Bennett, who was guest in his house, in which a revolver figured prominently; but the story was only vague, and Allan Bennett, who could, and would have, told the truth about it, had departed for a distant colony. 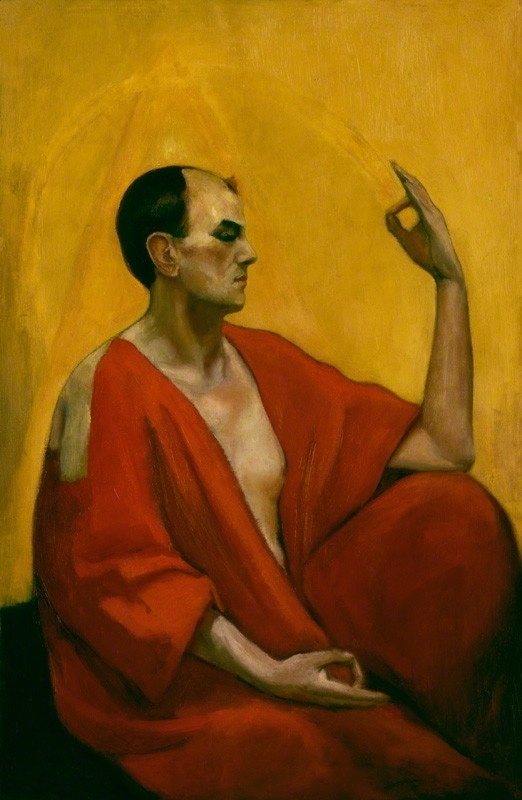 So on arriving in Paris, Aleister Crowley lured Mathers into telling the story, which was as follows: That he and Allan Bennett had disagreed upon an obscure point in theology, thereby formulating the accursed Dyad, thereby enabling the Abramelin demons to assume material form: one of his own shape, another in that of Allan Bennett. Now, the demon that looked like Allan Bennett had a revolver, and threatened to shoot him (Mathers), while the demon that resembled himself was equally anxious to shoot Allan Bennett. Fortunately, before the demons could fire, Mrs Mathers came into the room, thus formulating the symbol of the blessed Trinity, of which her great purity of character would naturally fit her to be a prominent member. Now, the only probability about this story, which Mathers related on his magical honour as a 7○=4□ (the highest grade of the Rosicrucian order), was that Mathers saw double. Crowley, however, was not going to judge any isolated story by the general laws of probability, so, bowing gracefully, he rose and set out to find Allan Bennett, whom he eventually ran down at the house of a holy Yogi in Cinnamon Gardens, Colombo, to hear his account. Whether overawed by the majesty of the saint, of interrupted by the entry of a third person, Allan Bennett no longer remembered, but Mathers never pulled the trigger. It was only after this interview, which did not take place till August 1901, that Aleister Crowley definitely decided against Mathers. Scorpio, K.C. You really ask his Lordship to believe this yarn about Abramelin demons? Scorpio, K.C. With regard to Dr Wynn Westcott, now: Was he your colleague? Dawn as the person to whom they should be returned in case of the owner’s death or disability? Scorpio, K.C. And these MSS. contain practical instructions for raising devils, making yourself invisible, transforming men into animals, making gold, making rain, and all the other fabled arts of sorcerers? Scorpio, K.C. In short, you and Dr Westcott were teaching the vilest practices of black magic? Scorpio, K.C. You quarreled with Dr Westcott? Scorpio, K.C. You were jealous of his authority? Mathers Divided authority is no authority. Scorpio, K.C. You are not a careless man? Mathers One cannot be too careful in matters of magic. Scorpio, K.C. Did you ever leave any magical MSS. in a cab? Mathers The best of us may err. Even Homer nodded. Scorpio, K.C. These MSS. were taken to Scotland Yard? Mathers I cannot say, of my own knowledge. Scorpio, K.C. That would be the usual course? Scorpio, K.C. Dr Westcott’s name and address being on them, the authorities would return them to him? Scorpio, K.C. Did they further intimate to Dr Westcott that he was paid to sit on corpses, not to raise them; and that he must choose between his Coronership and his Adeptship? Scorpio, K.C. So that he resigned active membership in the so-called Rosicrucian Order? Scorpio, K.C. Very fortunate piece of carelessness for you! Mathers Fortune favours the brave. Scorpio, K.C. I put it to you, this was a premeditated treachery on your part. Scorpio, K.C. In your letter of February 16th, 1900, you accuse Dr Westcott of “forging, or procuring to be forged” the warrant on which the Order was founded? Scorpio, K.C. And did anyone believe you? Scorpio, K.C. Who were they? Mathers Dr E. W. Berridge, Mr G. C. Jones, Mr Aleister Crowley, and a Mrs Simpson and her daughter. Scorpio, K.C. What of the other fifty odd in the London Temple? Mathers Mr Crowley expelled them. Scorpio, K.C. By what authority? Mathers By mine. He was at that time my plenipotentiary in London. Scorpio, K.C. And what did they do then? Mathers They expelled me and Mr Crowley. Mathers They all quarreled and expelled each other. Scorpio, K.C. The whole Order broke up? Scorpio, K.C. Why did they revolt against you? Mathers Firstly, because they thought that by declaring the Warrant to be a forgery, I had destroyed my own authority. Secondly, because they couldn’t make my methods of magic work properly. Thirdly, because they were tired of my incessant demands for money. Fourthly, because I refused to expel Dr Berridge from the Order. Scorpio, K.C. What complaints were made against Dr Berridge? Mathers That girls who came to him for examination in the Knowledge Lectures were subjected to insult. Scorpio, K.C. Did you investigate this charge? Scorpio, K.C. Was there any other charge? Scorpio, K.C. What was it? Mathers That he was disseminating objectionable literature. Mathers The works of Thomas Lake Harris. Scorpio, K.C. What is objected to? Mathers He recommends his pupils to invoke elemental spirits or “astral counterparts” for the purpose of carnal copulation. Scorpio, K.C. Was this charge denied? Scorpio, K.C. What did you do? Mathers I expelled his accuser. Scorpio, K.C. Name the accuser. Scorpio, K.C. The daughter of the great tea merchant? Scorpio, K.C. And who is Dr Berridge? Mathers He is the famous Dr Berridge. Scorpio, K.C. For what is he famous? Mathers For his Magic Clasp. Scorpio, K.C. What is that? Mathers A Mrs Cunningham, a member of my Order, claimed ?1,000 from him as the price of a Magic Clasp said to have been given by Cagliostro to Marie Antoinette. She sued him on a promissory note for the amount. Her story in court was that she went to his house with a friend on the date when it fell due. Dr Berridge tried to destroy the note. A struggle ensued; the note was torn, Dr Berridge retaining the half which bore his alleged signature. In court he declared this signature to be a forgery. Scorpio, K.C. And what did the experts decide? Mathers They had no means of deciding. Mathers Dr Berridge had burnt his alleged signature. Scorpio, K.C. What? He burnt the proof of his own integrity and of their dishonesty? Scorpio, K.C. How did he account for so extraordinary an action? Mathers The excitement of the moment. Scorpio, K.C. What did the judge say? Mathers That it was all very mysterious; that he did not believe either party to the suit; but that as the onus of proof lay on Mrs Cunningham, he must dismiss the case. Scorpio, K.C. Thank you. Now, has Dr Berridge any animus against Mr Crowley? Scorpio, K.C. How has Mr Crowley wronged him? Mathers Mr Crowley has laughed at him. Mathers Mr Crowley did him a good turn. Scorpio, K.C. How? Mathers In March 1910 Mr Crowley received an anonymous letter from “White Magician” enclosing a pamphlet by T. L. Harris, and accusing Dr Berridge of the foulest vices. Scorpio, K.C. What did Mr Crowley do? Mathers Sent a friend with the letter and pamphlet to Dr Berridge to warn him he had an enemy, and offering to help him in any way possible to defeat such anonymous assailants. Scorpio, K.C. Why did Mr Crowley act thus, if he had no respect for Dr Berridge? Mathers He would probably say it was because, however much he disagreed with a man, he would not see him the victim of foul play. Scorpio, K.C. And how did Dr Berridge repay the service? Mathers By perjuring himself to Mr Crowley’s disadvantage. Scorpio, K.C. Now as to this “Rosicrucian” Order. Let me read to you from the Obligation of a Neophyte: “All these I swear to keep under the no less penalty than that of . . . submitting myself to a deadly and hostile Current of Will set in motion by the Greatly Honoured Chiefs of the Second Order; by which I should fall slain or paralysed, as if blasted by the Lightning Flash.” Is that correct? Scorpio, K.C. Is it meant to be taken seriously? Scorpio, K.C. Members of the Order, were, in fact, afraid of the penalty? Scorpio, K.C. If they refused to obey you, you would cause them “to fall slain or paralysed, as if blasted by the Lightning Flash”? Mathers They deserved it, and worse. Scorpio, K.C. Is it a threat of assassination? Mathers Of occult assassination, yes. Scorpio, K.C. You did actually rattle peas in a sieve, ceremonially? Mathers It is a well-known practice of Sympathetic Magic. Scorpio, K.C. Like sticking pins in a wax figure? Mathers Exactly. One identifies the rebels with the peas, and rattles them. Scorpio, K.C. That explains their subsequent debacle? Scorpio, K.C. But you expected them to “fall slain or paralysed”? Scorpio, K.C. Actually, not in a figure of speech? Scorpio, K.C. It is attempted assassination? Scorpio, K.C. And in any event, if they were really afraid of it, the threat amounted to black mail? Mathers I am not a lawyer. Scorpio, K.C. Now then, let us get back to James VI. You say you are James VI? Scorpio, K.C. James VI was killed on Flodden Field? Scorpio, K.C. A lady of unblemished reputation, Mrs Markham, has gone into that box, and sworn that he was so killed. Mathers One must not contradict a lady. Scorpio, K.C. Well, what happened to him? Scorpio, K.C. When do we hear of him again? Scorpio, K.C. Have you read Mr Crowley’s poem “The Rosicrucian,” dedicated “a sa Majeste Jacques IV d’Ecosse”? Mathers Yes. Mr Crowley was a very young and foolish boy. Scorpio, K.C. He believed you to be James VI? Scorpio, K.C. Did he or did he not? Mathers It was not my fault if he didn’t. Scorpio, K.C. You borrowed considerable sums of money from him? Scorpio, K.C. On that ground? Mathers That sort of ground. Scorpio, K.C. He was rich? Mathers I believe he had just come into some ?30,000. Scorpio, K.C. He offered you the whole of his fortune in order to help you in your trouble with the revolting members? Scorpio, K.C. Why did he make it? Mathers He believed my stories about James IV and the Secret Chiefs, I suppose. Scorpio, K.C. Madame Horos had promised you ?2,000? Mathers Yes. Scorpio, K.C. Was that why you admitted her to be your superior? Scorpio, K.C. Crowley offers you his fortune; and you immediately appoint him to the sole power in England, over the heads of Dr Westcott and Sir Henry Colville and W. B. Yeats and Mrs Emery and Sir William Crookes and Dr Berridge and dozens of others who had been members of the Order for years? Scorpio, K.C. This is only a coincidence? Scorpio, K.C. Besides the money that Crowley lent you, did he ever give you any? Mathers Yes; a wealthy lady, the wife of an English officer, a Colonel, being interested in occultism, once gave him ?20 for me. Scorpio, K.C. Is that all? Mathers She gave him some jewels for the purpose of decorating a statue of Isis for my temple. Scorpio, K.C. She quarreled with him subsequently? Mathers I believe so. In fact, I made quite a big story of it. Scorpio, K.C. They are good friends again, however? Mathers He has a whole sheaf of the friendliest letters from her, up to date. Scorpio, K.C. Well, we left Mr Crowley as your Envoy Plenipotentiary to the “rebels.” He shortly afterwards went climbing in Mexico? Mathers Yes, with Mr Eckenstein. Scorpio, K.C. What was Mr Eckenstein’s Christian name? Mathers I — er — I see ladies in Court. The Judge Any ladies in this Court are probably beyond any scruples of that sort. Scorpio, K.C. Answer the question. Scorpio, K.C. Did Mr Crowley on his departure leave anything in your charge? Mathers Some books of poetry. I couldn’t get a single franc on them; I returned them to him when he came back. Mathers A fifty-guinea dressing case, and another portmanteau. Scorpio, K.C. Where are they? Scorpio, K.C. Did you return them to the owner? Scorpio, K.C. In Konx Om Pax Mr Crowley accuses you of stealing these bags? Mathers He didn’t mention the bags specifically. He only said I was a thief. Messrs Nussey and Fellowes, my Solicitors, wrote threatening him with an Action. Scorpio, K.C. What did he reply? Mathers I changed my solicitors. Scorpio, K.C. Perhaps it would be more correct to say that your solicitors changed you! You several times threatened Mr Crowley with legal proceedings? Scorpio, K.C. Did you ever take any? Mathers Once, for breach of copyright. Scorpio, K.C. And tried for an Injunction against The Equinox? Scorpio, K.C. Have you paid those costs? Scorpio, K.C. Did you then bring the action? Scorpio, K.C. It was a frivolous excuse for the injunction? Mathers I refuse to answer the question. Ask Mr Cran. I had almost forgotten dear old Mathers. Yet it was only last December that a colleague of mine was told by some greasy old harridan, in her best nominal 7○=4□ voice (she had paid hundreds of pounds for that nominal 7○= 4□, and never got initiated into any mysteries but those of Over-eating) that Imperrita was coming over from Paris to crush Crowley; and Crowley has fled before his face. Anyhow, I sneaked back from Algeria, trembling all over, and began to enjoy the comedy of a lawyer pretending that he could not serve a Writ on a man with an address in the telephone directory, who was spending hundreds of pounds on letting the whole world know where to find him. It was perhaps unkind of me not to warn Mr Cran that he was putting his foot in it. But if I had said a word, the case would have been thrown up; and then where would our advertisement have been? So, even now, I restrict my remarks; there may be some more fun coming. Served a Writ, and away he ran before a Writ was served! Though he might have guessed that it would be. But he couldn’t possibly have known that the action would be dropped, as it has been. And Mathers has run away too — without paying our costs. It reflects seriously upon Mr Cran’s professional honour, does it not? Scorpio, K.C. Has he taken action? Scorpio, K.C. So Mr Crowley laughed at you? Mathers Those who laugh last laugh best. Mathers I waited for my opportunity. Scorpio, K.C. Did it arrive? Mathers All things come to him who waits. Scorpio, K.C. Describe what happened. Mathers A paper called The Looking Glass attacked Mr Crowley. I went to the editor (Mr W. F. de Wend Fenton) and told him all I knew — and a good deal that I didn’t know. Scorpio, K.C. Was the editor actuated by malice against Mr Crowley? Mathers The day after his first article appeared he telephoned to a mutual friend, a Miss O—, explained that he meant no harm, and would like to meet Mr Crowley at dinner and have a chat with him. Scorpio, K.C. What happened then? Mathers Miss O— told Mr Crowley. Scorpio, K.C. And what did he say? Mathers He made an answer so remarkable that I remember it every word. Scorpio, K.C. What was it? Scorpio, K.C. What does this show? Mathers Mr Crowley’s horrid suspicious temper. Scorpio, K.C. What did Miss O— do? Scorpio, K.C. You really know this of your own knowledge? Scorpio, K.C. Did Mr Crowley take action against The Looking Glass? Mathers On the advice of a friend with twenty-five years experience of City Journalism. Scorpio, K.C. What did the friend say? Scorpio, K.C. What did Mr Crowley’s journalistic friend say? Scorpio, K.C. Was Mr Fenton in fact warned off the Turf? Scorpio, K.C. You blame Crowley for not taking action? Scorpio, K.C. You’re not very ready to take action yourself. Mathers I am a man of peace. Scorpio, K.C. The “military bearing” is only for show? Scorpio, K.C. Mr Crowley has written books, which houses of the highest standing have published, in which you are openly called a common thief, an habitual swindler, a blackmailer, and accused of drunkenness and attempted assassination? Mathers Yes; but he supports his charges by unimpeachable documents, and witnesses of unassailable integrity. Scorpio, K.C. And there is no ground for the charges against Mr Crowley? Mathers There is Dr Berridge’s evidence. Scorpio, K.C. Let us go into that. Mr Crowley’s conversation with Dr Berridge took place in 1900? Scorpio, K.C. And was first repeated in the Court of King’s Bench in 1911? Scorpio, K.C. Dr Berridge must have a splendid memory. What were the relations between Crowley and Berridge in 1904? Mathers They were friends and colleagues. At the Ceremony of the Vernal Equinox in 1903 Crowley was Hierophant, and Berridge Praemonstrator or Cancellarius, I forget which. Scorpio, K.C. So it took Dr Berridge some time before he attached a criminal significance to Crowley’s remark? Mathers The mind of Berridge works slowly, but it works exceeding small. Scorpio, K.C. As to the remark itself. Take the first part. Berridge mentions to Crowley the ugly rumours that his enemies were circulating. Crowley replies: “So and So and So and So and So and So have been to my flat and passed the night.” I suggest that the names mentioned were those of mutual friends of Crowley and Berridge, men beyond suspicion. Mathers It may have been so. Scorpio, K.C. I must ask you to remember that Crowley was brought up among the Plymouth Brethren, and that at this time he had no more knowledge of the world than most boys of 16. He swallowed your yarns easily enough, didn’t he? Scorpio, K.C. Now take the second part. “For the last eighteen months or two years there has been nothing that the police could get at me for.” That implies that previous to that date there was something. Horrible as already in hell . . .
How vile a thing of woman born may be . . . It is clear from this that Crowley had been associated with a man of bad character; but that on discovering him to be so, he instantly disowned him? Scorpio, K.C. Mr Crowley may have thought that even an innocent association with such a person was criminal? Mathers He was very young and foolish. Scorpio, K.C. Is it this that he referred to in his remark to Dr Berridge? Scorpio, K.C. And that is all there is against Mr Crowley? Mathers There is The Sword of Song. Scorpio, K.C. Did anyone discover this before you did? Mathers Not to my knowledge. Scorpio, K.C. Did Captain Fuller in his three years’ laborious study of Mr Crowley’s works discover it? Scorpio, K.C. Is there any point in these — do you call them jokes? Mathers No point at all. Scorpio, K.C. Are Mr Crowley’s jokes usually pointless? column in the Daily News, in which the book is treated as a serious contribution to Philosophy. Scorpio, K.C. Is there anything else? Mathers There’s The Mother’s Tragedy. Mathers A book of poems one of which deals with a subject which I blush to mention. Scorpio, K.C. Has any wretch previously dealt with it? Mathers Sophocles in Oedipus Rex; Shakespeare in Hamlet and in Pericles; Malory in Morte d’Arthur; Byron in Parisina, Manfred, and other poems; Shelley in The Cenci, Rosalind and Helen, and in Laon and Cythna; Wilde in Salome; Ford in The Unnatural Combat and ’Tis Pity She’s a Whore; Moses, Wagner, Schiller, Alfieri, and many other authors of the highest reputation. Scorpio, K.C. But Mr Crowley tries to sell his works by printing reviews which describe them as “revolting”? Mathers Yes, that’s the bad part. Scorpio, K.C. Has not Mr Crowley habitually reprinted all sorts of reviews of his works, good and bad, with a giant’s contempt for reviewers? Scorpio, K.C. But was this particular review really so unfavourable? Mathers Not at all; but by picking out a single sentence, I made it appear so. Scorpio, K.C. What about these aliases of his? Why did he assume the name of MacGregor? Mathers At my suggestion. He was about to take a house in Scotland, and I thought it would attract less remark if he took a Highland name. Scorpio, K.C. But why MacGregor rather than any other Highland name? Mathers To assert an “astral link” — what you might call a bond of sympathy — between himself and me. He had gone there to perform a magical operation detailed in a book which I had just published. Scorpio, K.C. He was at this time quite under your auspices? Scorpio, K.C. And why did he call himself Lord Boleskine? Mathers Principally to annoy the snobbish society of Inverness. Scorpio, K.C. And did it annoy them? Scorpio, K.C. But why Lord Boleskine? Mathers He is the Laird of Boleskine, and Laird is only Scots for Lord. Scorpio, K.C. And why did he call himself Count Svareff? Mathers In the book of mine I referred to it says that the Aspirant to the Sacred Magic would be much annoyed by his family seeking to dissuade him. So he changed his name and disappeared. Mathers The romantic young idiot had just come back from Russia. Mathers All Russians are Counts, I believe, when they’re not Princes! Scorpio, K.C. You say he obtained a large sum of money from a celebrated singer? Scorpio, K.C. A married woman? Scorpio, K.C. Of what age? You must remember that Crowley was a mere boy. Mathers Ten or fifteen years older than Crowley. Scorpio, K.C. On what pretext did he obtain the money? Mathers She proposed to Crowley to go with her to Texas, divorce her husband, and marry him. Scorpio, K.C. What did Crowley do? Mathers He gave her a fifty-guinea engagement ring. Scorpio, K.C. Did the scheme come off? Scorpio, K.C. Did she return the ring? Mathers Crowley complains in The Sword of Song that she did not. Scorpio, K.C. And what about his obtaining money from her? Mathers Oh! that’s only my fun. Scorpio, K.C. You mean, it’s a lie? Mathers Well, it’s not true. Scorpio, K.C. Is that all you have against Crowley? Mathers No; he was divorced from his wife. Scorpio, K.C. What was his fault? Scorpio, K.C. Give the facts. Mathers They are known to all Mr Crowley’s intimate friends, who approve his action throughout, and they may be surmised from the poem “Rosa Decidua,” published in The Winged Beetle. But the facts being detailed in Mr Crowley’s petition for the reduction of the decree of divorce, they cannot be entered into more fully at this moment; and as the unhappy lady became insane in September 1911, I think we may well leave the matter in its tragic silence. Scorpio, K.C. Then Mr Crowley was not to blame? Mathers Not in this matter. But he is an associate of the notorious Jones. Scorpio, K.C. Oh, well! we won’t go into that. Thank you.